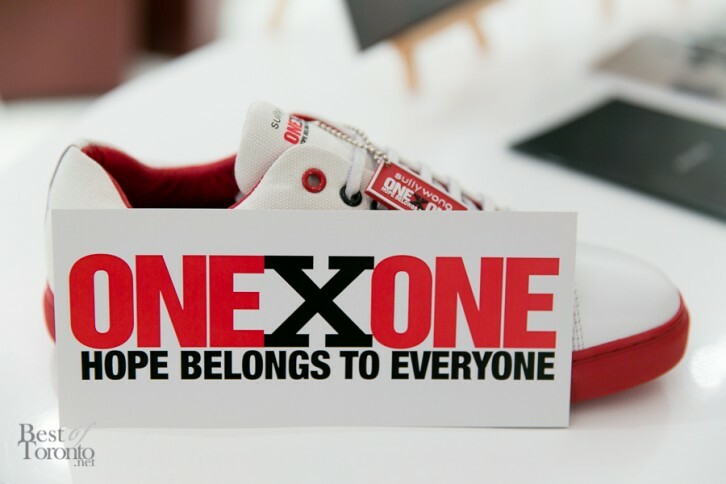 The charity ONEXONE has collaborated with designer label, Sully Wong Shoe Company, to create the LIMITED EDITION Sully Wong x ONEXONE HOPE Sneaker. It’s a one-of-a-kind unisex sneaker with 50% of the proceeds going to support ONEXONE Paediatric Wing in Hospital Mirebalis in Haiti. Only 360 pairs of the shoe have been made with availability starting at the King West Block Party hosted by Brad J. Lamb Realty. The King West community is invited out to the King West Block Party for an all-white, indoor and outdoor street-front lounge with entertainment by DJ Lissa Monet, along with food and beverage offerings from ABSOLUT Elyx Vodka, SmartWater, PrettySweet, Rose City Kitchen food truck and Acai Dreamzz food truck. The block party takes place at Brad J. Lamb Realty Inc at 778 King West on Saturday, July 19th noon to 4pm. The limited edition Sully Wong x ONEXONE HOPE Sneaker features ONEXONE’s iconic red and black signature colours, combined with Sully Wong’s clean, low-cut silhouette style. The shoe also incorporates a quality natural duck canvas exterior with a red, hand-stitched capsule base. Added details include eight ONEXONE inspired custom-lace eyelets; an outer heel and toe thread; and is complete with a removable commemorative ONEXONE footpad. The sneaker is unisex, and there are only 360 pairs available in a full size range – women’s 6-9 and men’s 9-13 – for $150 plus HST. Also check out our photos from the ONEXONE Million Meals Movement concert.